Northern Spy Food Co. is one of my neighborhood go-to spots. It features a great menu of locally sourced seasonal fare and delicious homemade seltzer. It’s also the perfect walking distance from my apartment–I can order dessert and not feel completely stuffed when I arrive home. I have never been disappointed by these guys. Attention Seltzer Magician: That blood orange fabulousness I guzzled down tonight was a 10! I didn’t know I could love anything so much! I’ve had many of your homemade varieties but this one tops the charts. A blood orange never disappoints—so full of flavor and just the right touch of pucker. And combined with just the right amount of bubbles and a straw: SHOW STOPPER! Now, how do I go about getting this recipe? 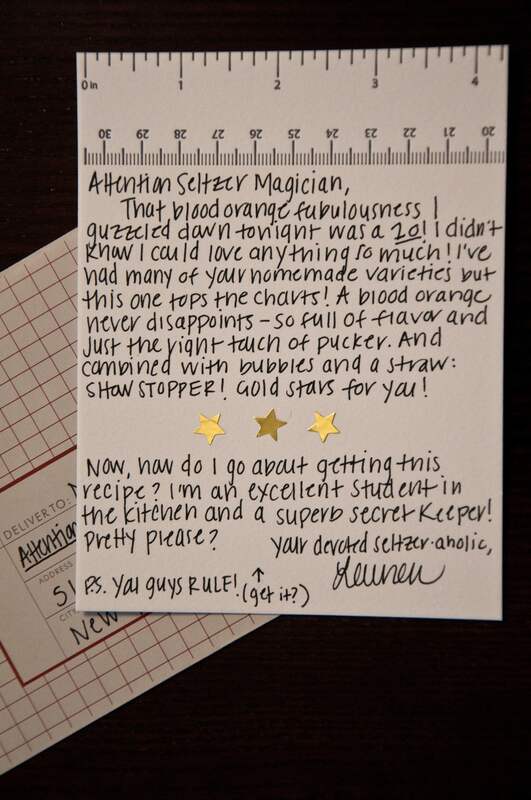 I’m an excellent student in the kitchen and a superb secret keeper. Pretty please?